As with all retailers, Movado’s business has taken a hit, during this tough economy. These times have been witness to many Companies going out of business or making concessions in the way in which they do business. Changing business tactics, such as more out sourcing or cutting corners is the way some retailers have dealt with the recession, but Movado is different. This watch maker has integrity and staying power. They have been affected as much as others, but Movado’s attitude has been to ride it out. Of course, the Swiss watch company has had to make some strategic changes, but not in the quality of their products. Unlike many watch companies, who have always made most of their sales through third party retailers or on-line stores, Movado has always had a boutique retail business. 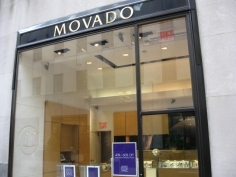 The Movado Boutiques are chic and cater to Movado watch and jewelry clients. Each of the Movado specialty Boutiques featured not only watches and jewelry, but Movado accessories, as well. While unique and special, the Boutiques were costing the Company close to $10 million dollars a year. Closing the Boutiques is just smart business. For now, only the flagship Boutique in Rockefeller Center will remain open, and Movado can concentrate on bringing us new and creative designs, through their on-line store and 31 outlets. The bottom line is that Movado is still going strong.